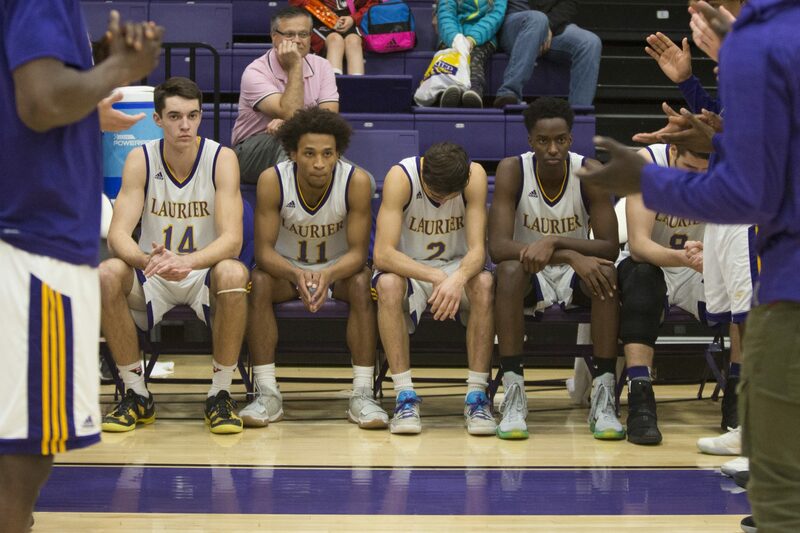 It’s been a while since the Wilfrid Laurier University’s men’s basketball team has had a home playoff game. That changed on Feb. 21 and it also came with a huge win over the red hot McMaster Marauders. This game had a whole different outcome than most expected, with the Hawks winning by 26 points. The Golden Hawks came out firing after a couple of easy buckets by the McMaster squad. It started out with some offensive rebounds off the hustle of Kemel Archer and it was on from there with the help of a 13-0 run as they went up 10 at one point and finished the quarter up 24-17. The offensive onslaught continued as the Golden Hawks were able to consistently increase their lead through their ability to stick to their game and never breaking under pressure. With great ball movement — 27 assists to only 11 turnovers — shooting the ball at such a high clip and playing stifling defense, Laurier dominated. “I thought we had good movement, making sure everyone was involved and it started with Kokko and Ali. When they’re in the right mindset, which means they’re still aggressive to get to the rim on getting their shots but [they] never lose strike of “who’s open” and we did that. Everybody was locked in and confident,” Serresse said. Going into the third with a nine-point lead, which ballooned to 18 at one point, caused McMaster to fell apart more and more as the game continued. In the fourth, that lead hit 30 at one point and Laurier closed it out by a final score of 102-76. The match up on Feb. 24 brought a whole new challenge against a familiar foe in the Brock Badgers. With the game being so close the last time around, there was hope the Hawks could challenge the Badgers once again. That didn’t happen as Brock came up with a big 91-73 win. The Badgers pressured and flustered the Golden Hawks into a 27-6 quarter having started out the game on a 13-0 run. It only got uglier in the second quarter as the Badgers went into half up 53-14. The young Golden Hawks played a far better second half being able to put up a respectable 59 points but Brock didn’t let up as they never allowed their lead to fall below 16 points. In what was a very trying game, the young Hawks’ season came to an abrupt end Saturday. “I think [it was] the mental aspect of it. Guys weren’t able to settle in and focus on things we were supposed to do, offensively especially, to get us going,” Serresse stated. With a young team that has shown so much promise in challenging and beating top teams this year, in addition to having a roster loaded with talent, coach Serresse knows the expectations are only going to be higher next year.